Denver Comic Con 2018 was an epic event for everyone who attended. Aside from the incredible lineup of celebrities, including Jason Momoa, Val Kilmer, and Pom Klementieff (to name a few), attendees were treated to panels with NASA scientists, Star Wars crew members, comic artists, authors, special effects creators, and so much more. Of the many excellent panels at Denver Comic Con 2018 to attend, one of the most unexpectedly entertaining was: “Sounds of Star Wars: Characters, Klaxons, and Aliens,” featuring a behind-the-scenes look at how foley artists created the sound effects for the original Star Wars trilogy as well as the modern-day Star Wars films. The panel’s “Wilhelm Scream” compilation was a big hit with attendees, calling attention to Ben Burtt’s long legacy of sound design and the creative ways he was able to manipulate original and borrowed sounds to create an auditory journey for the original Star Wars franchise. Awe-inspiring comic art lined every walkway at the event, highlighting artists new to the scene as well as revered legends like Frank Miller, Jim Davis, and Darryl “DMC” McDaniels. McDaniels joined the comic scene with his own publishing house in 2014, establishing Darryl Makes Comics as a vital addition to the comic landscape. His full-length graphic novels, “DMC” #1-3, are stunningly illustrated and clearly representative of McDaniels’ passion for the art form. Innovation & Tech Today scored an exclusive interview with McDaniels to discuss comics, music, and how superheroes helped him to transition from a “little nerdy kid” to a successful hip-hop artist, comic creator, and entrepreneur. The full interview will soon be available on Innovation & Tech Today’s social media channels (stay tuned!). Denver Comic Con is produced and presented by Pop Culture Classroom, which culminates in a variety of compelling presentations for educators, parents, and children. Some notable panels included: Using Comics in STEM Classrooms; Using Narrative to Empower Teens; Promoting Women in STEM through Pop Culture; Leadership Lessons from Star Wars; The Science of Superheroes; and Using Fan Theories to Explore Critical Reading. Science and education were key focal points for DCC organizers, as demonstrated by the many NASA panels available for attendees. One particularly stirring presentation focused on the difference between science fiction and science, as NASA scientists and sci-fi authors answered questions from fans about the realities of space travel, solar radiation, and interstellar battle. Horror fans had more than comics to keep them entertained, as the Reel Heroes portion of DCC was riddled with horror-ific presentations, such as Creature Feature: FX of Horror, How to Write a Killer Horror Film, and a special screening of Wolfman’s Got Nards, a documentary highlighting the fandom surrounding the 1980’s cult classic The Monster Squad. We had the opportunity to speak with Andre Gower and Ryan Lambert about the new documentary and will be sharing their insights with you in the weeks to come! Gower played the loveable lead Sean in the original film and directed the new documentary, while Lambert played the rough-and-tumble bad boy in the 80’s film and recently reconnected with Gower for Wolfman’s Got Nards. One of the most popular panels featured Sean Gunn and Pom Klementieff, stars of The Guardians of the Galaxy Vol. 2, discussing their experience making Guardians and answering questions from excited fans. The duo met with their eager followers for autographs and photographs in the Celebrity Summit on Saturday, alongside stars such as Ron Perlman, Alan Tudyk, and Bonnie Wright. 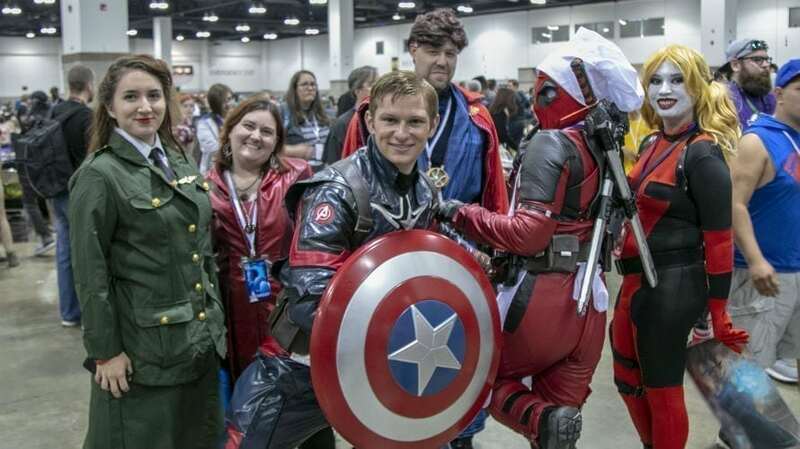 Whether you are a comic fan, a follower of pop culture, a lover of literature, or just eager to wear your new Deadpool costume in public, Denver Comic Con 2018 had something for people of all ages. If you missed this year’s event be sure to stay connected with I&T Today for continuing coverage, interviews, pics, and video from DCC 2018.